This month of September 2018, Adobe announced that it is purchasing marketing automation company Marketo. We’re providing a point of view (POV) and perspective to help explain the rationale for combining the companies, and what benefits customers can expect. 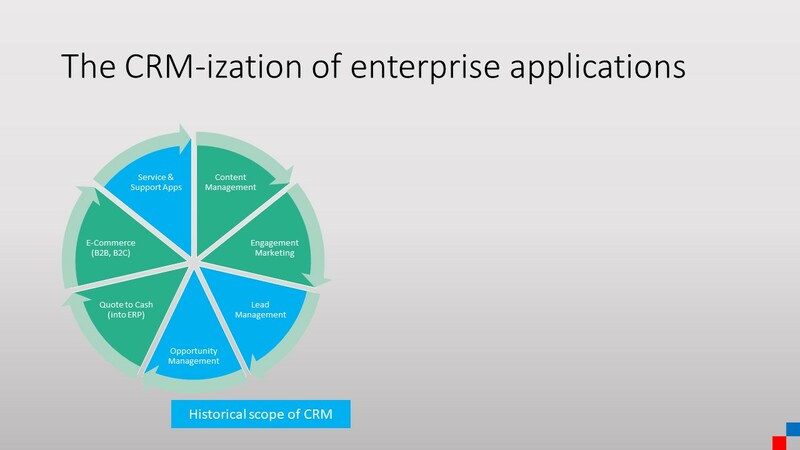 What is the scope of the CRM market? Before discussing marketing automation, it is important to observe a trend that has been taking momentum in the past two decades, roughly since the early 2000’s: the CRM-ization of enterprise software. This date corresponds roughly with the birth of Salesforce. Customer Relationship Management emerged out of spreadsheets, and contact databases stored in email clients like Microsoft Outlook, with the concept of “objects”. By storing this information in a relational database, information moved from an employee’s local computer to a shared server, making data more resilient to loss, and easier to share and organize. From a glorified contact database, CRM built itself on two use cases: sales pipeline management, and support ticket management. It was a simple world: your customer is looking to buy something, or your customer is looking for help with something they bought. Since the 1980s and the first CRM systems, this is what CRM meant: sales, and service. The interactions and engagements with the customer (email, app notifications, SMS, and the orchestration rules to know what to send, when, and to whom). Interactions and engagements are a very broad category, now including social media. Linkedin, for example, is a CRM company, holding work relationships between professionals, and is used by most sales people. It made perfect sense for Microsoft to buy it. They also include the ongoing signals a business can capture from how customers are using its products, to help product managers design future releases, or for the business to proactively reach out to a customer who bought a piece of software but hasn’t been implementing it. The sales pipeline for B2B, and the subsequent purchasing cycle (quote to cash, Q2C, moving into enterprise resource planning ERP). Consider, in this case, that ERP used to be a peer market to CRM in the past decades. We can see how Q2C is moving to the CRM addressable market, while CRM functions are not moving to ERP addressable markets. The trends goes one way. The buying process for consumer products, in B2C, with online shops, and increasingly for B2B scenarios, bringing e-commerce into the field of CRM. Servicing includes the traditional ticketing systems, which append to the customer’s account record, and now include newer tools like live chat, and self-service knowledge base. Platform apps extend the core applications with unlimited features, from ISV partners. 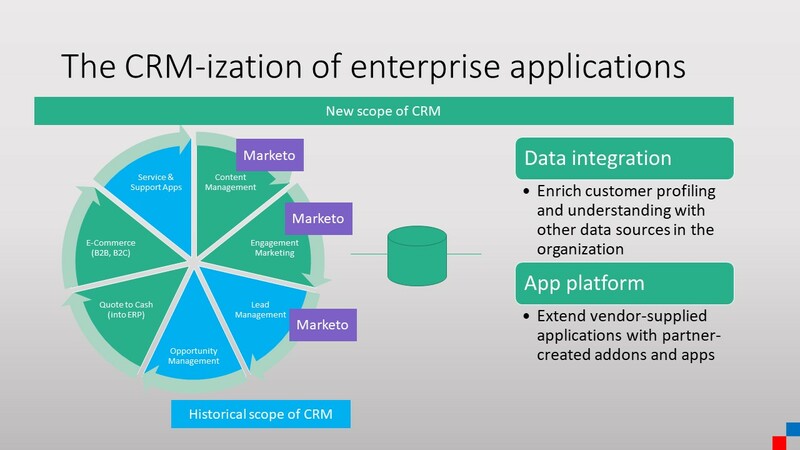 Finally, and this is highlighted by Salesforce’s acquisition of Mulesoft earlier in the year, data integration moves into CRM territory, given that at the end of the day, most of the data corporations store relates directly or indirectly about their customers. As a result, the addressable market for CRM markets and companies also ballooned. CRM has changed over the years. Marketo is one of the large software providers of marketing automation tools. They help companies engage with their prospects, clients, and integrate with other CRM tools. So when you are done working the with Marketo apps, you can continue with sales opportunity and pipeline management in Salesforce. In some areas, Marketo and Salesforce partners. In other areas, they compete, since Salesforce also has two suites of marketing automation products, Marketing Cloud, and Pardot. Marketing automation: send emails, SMS, push notifications using an engagement engine that helps better engage with customers. B2B asset repositories: content assets, templates. Sales Engage: lead scoring helps surface the interesting prospects for sales teams to contact. This is the intersections with sales clouds, which take it from there. A platform for partner apps to build apps and extend Marketo’s functionalities. 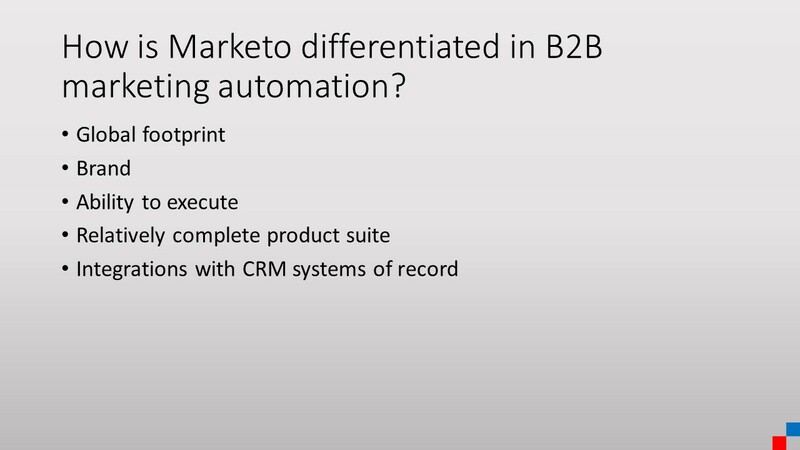 Marketo is primarily a B2B company through its products and customer base. 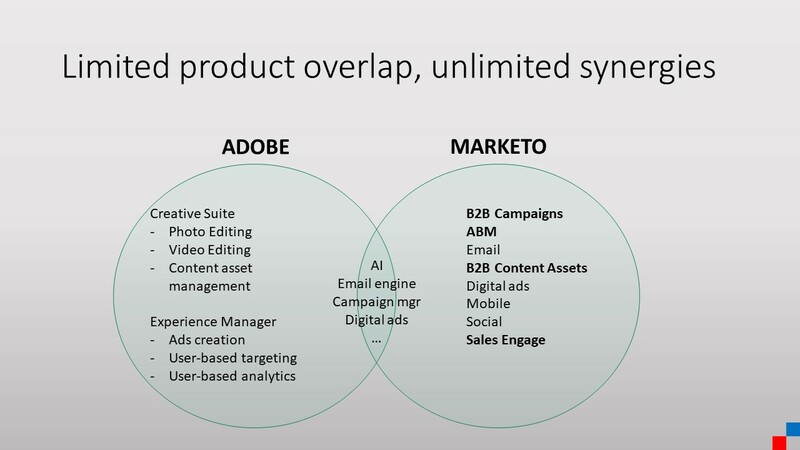 On the other hand, Adobe focused to this day more on the B2C segment, which makes the combination senseful with minimal overlap. What are the customer purchasing considerations for marketing automation solutions? Because cloud applications store data outside of their customer’s physical firewalls, the first consideration is trust. Trust means the data is secure, backed up, always available, at equal or higher service level agreements (SLAs) than customers’ internal IT departments would likely perform. From this point on, features matter, but the topic of features includes less tangible criteria like usability of the software, in other words user friendliness. Another key criterion is the effectiveness of marketing campaigns. What’s the deliverability rate? What’s the open rate? How much engagement can Marketo customers drive with their customers, versus using other tools? From the above, we can group the differentiations for marketing automation and CRM software in two categories: one being the capability of the software, in terms of robustness and feature set. The other category, still emerging at this point, is the amount of data you can connect and make sense of, which is not only a matter of technical capability. It is a matter of being able to collect the user data through an ad business which stores cookies and allows retargeting, for example. It is a matter of linking someone’s individual profile with a B2B account that the person works at. 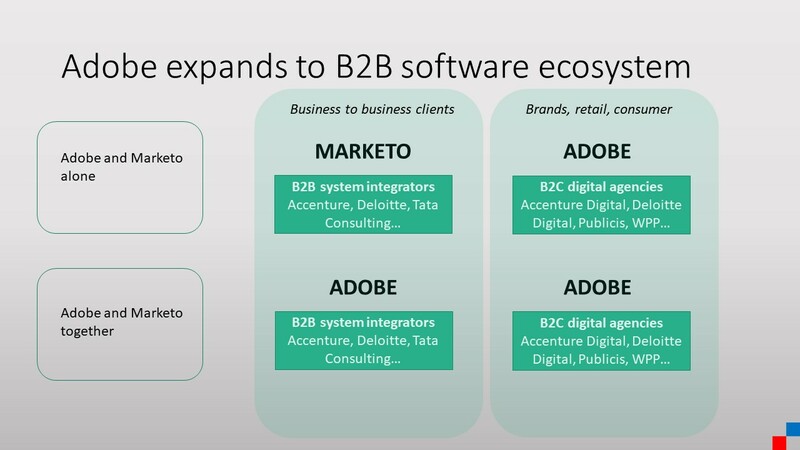 The vision from the acquisition is to solidify Adobe’s role as a B2C and B2B software provider to corporate customers. One thing to note also, is that at this time, Adobe’s Experience Cloud business is growing at a rate of 21% — slower than some of the top players in the field like Salesforce, still growing in mid-20% range. The opportunity for Adobe is to accelerate this 21% figure, and it can accelerate it significantly. 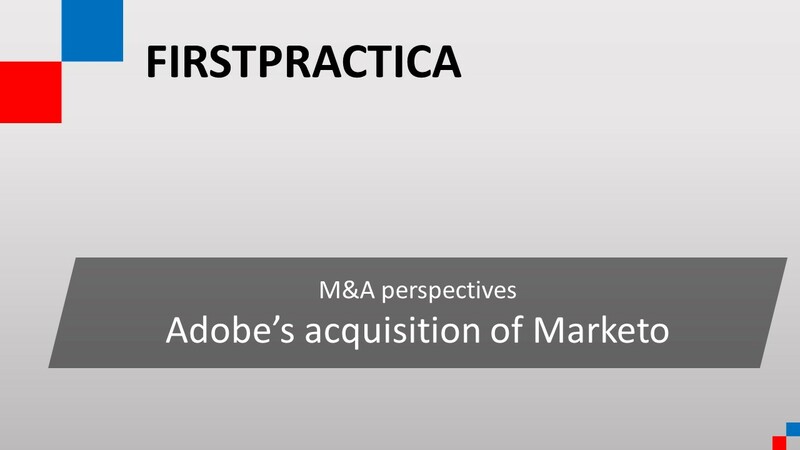 The broader opportunity for Adobe could take the shape of further acquisitions in the enterprise, B2B software space and round up its portfolio. Other players in the field have considerably more apps. How do customers benefit from the synergies? Adobe can now help its customers (which we can call level 1, L1) better connect with their customers (level 2, L2). Level 1 customers should be able to create and run L2 customer journeys which include the combined data about accounts and advertising. This means, for example, that a L1 corporation which sells industrial pumps could run campaigns including emails, text messages and device notifications through the Marketo tools, while at the same intelligently coordinate ads for display on websites that L2 customers will be visiting. 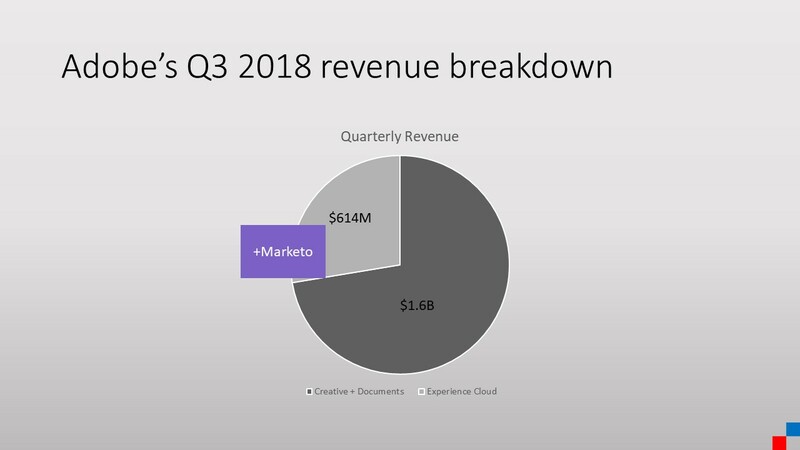 Another example where both L1 and L2 customers benefit is in the quality of the creative assets, with all Marketo materials now getting a UI boost from Adobe’s know how in the space. All acquisitions rely on the combined company to pursue the business integration without getting distracted. This risk factor will be no different for Adobe and Marketo. There is not much overlap in product capabilities between the two organizations, which eliminates one of the biggest risks in acquisitions. How the growth rate of Adobe’s Experience Cloud evolves over the next quarters and next couple of years. How the market responds: does this prompt more consolidation with B2B players buying B2C software companies? 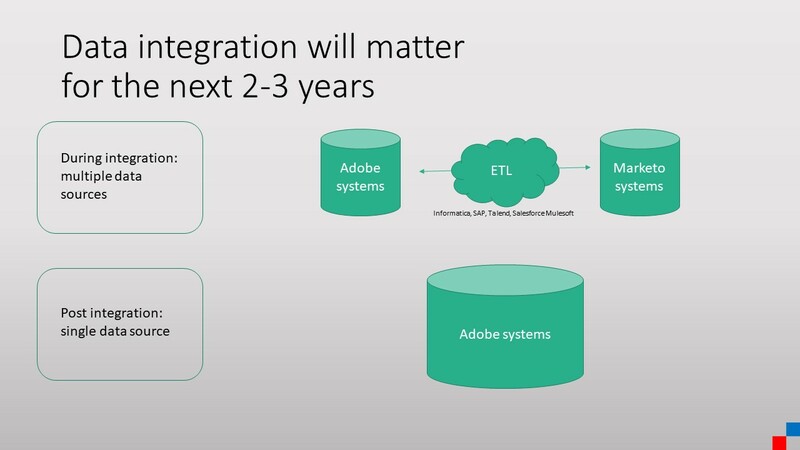 Adobe is entering CRM, at least the marketing segment of CRM, with its Marketo acquisition. There is a tremendous opportunity to build a combined product that leverages the best technologies from both companies, as well as highly differentiated data sets about consumers and professional’s individual profiles and B2B account information. This will be, in many ways, a data warehousing and business intelligence project to integrate the companies. Perhaps one more reason why having Steve Lucas at the head of this project, with his data background from Business Objects, sets the stage for success. Featured on Business Insider, Network World, Microsoft Engineering Summit, Social Science Research Network, Opensource.com. We work with clients directly and through GLG, Coleman Research, Third Bridge, Guidepoint.